I have created another one here today! 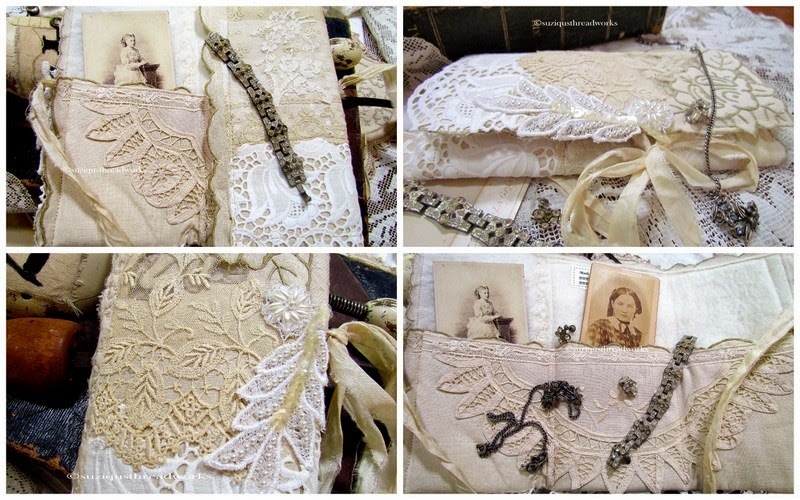 some gorgeous antique and vintage pieces of lace. and this is available in my Etsy shop. The last one went so quickly that I didn't want to disappoint! I am sure there will be more if the demand exists! (I am sorry dear readers - this one too has now sold!). Labels: Antique Lace meets new lace in a Jewellery Keepsake. Of course it's sold, it's so beautiful! It is beautiful Suzy. It does not surprise me it is sold. Old lace is so lovely. Not surprising that. This beauty sold so quickly, it looks like you will be making more, Suzy! I always enJOY visiting you here. Pipped at the post again, but it's here forever to drool over. Gorgeous. Oh Suzy, how gorgeous!!! And I adore your antique pictures you show, were they included? No shocker there. Of course it sold - it's jaw-dropping beautiful. One more beautiful, than the other....which one I don`t know as they are both beautiful inside and out, --just like you are dearest Suzy. Lovely, lovely materials, beauty from days gone by, created for new adventures !! beautiful in every way. girl you just keep showing me art and just how creative a girl can get. Thanks for taking the time to show us "what ya do"
Hi Suzy, I left a comment earlier but I don't think it went through so I will try again. I love your work and the lace is gorgeous mixed with the jewels. Your talent is incredible and this is so dreamy and romantic. I am sure it will fly off the shelf in your etsy shop. Simply gorgeous, dear Suzy and I think you need to create more. Of course they're selling fast!! Owning something so beautiful created by your clever hands is what we'd all like to do! Two Cards of Innocent Vintage Beauty!